Like fortune, Lûmé has always favoured the bold. 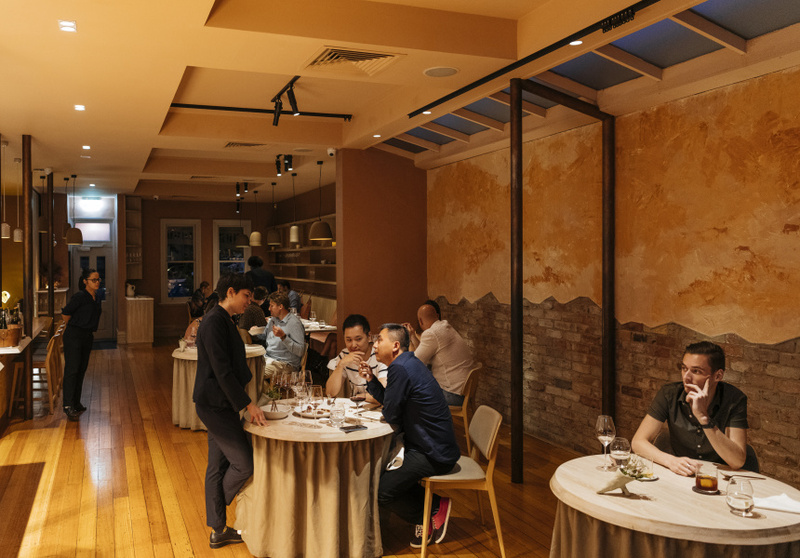 Since opening in 2015, Shaun Quade’s innovative restaurant defied culinary expectations with its experimental 14-course tasting menu. In 2019, Quade shifted focus to an LA endeavour, moving into the role of Lûmé’s general manager, passing creative reins to 25-year-old wunderkind John Rivera. Lûmé resides in a Victorian townhouse that once served as a burlesque venue. Richly textured, peach-coloured walls are detailed with cave paintings of hunter-gathers. These walls give way to original brickwork and blonde-wood joinery. Plates and knives are emblazoned with the diacritic ˆ and ´ of the venue’s namesake, while Quade and four other key staff have the marks visibly tattooed. Detail reigns supreme. There’s even complementary beard oil in the men’s bathroom. This interior remained largely unchanged in the 2019 reboot. Although the space now seats more (80) diners, and there’s the option to sit at the bar. The music has been cranked up ever so slightly, giving the effect of a more bustling, and less stuffy, dining space. The big change: Lûmé’s menu is now available in three, five or seven courses, priced at $100, $140 and $170 per head, respectively. The extravagant whimsy of Quade’s 14-courses (“It looks like X, but tastes like Y!”) is gone, for now. 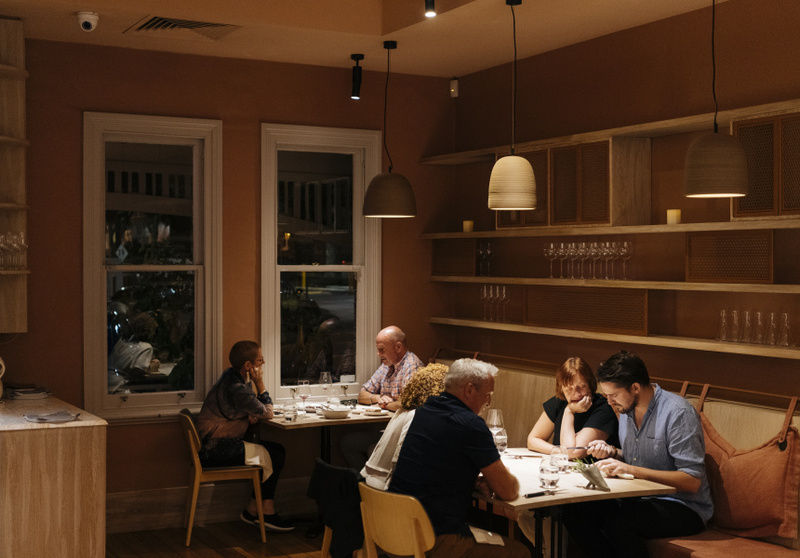 What’s on show is chic and accessible food that defies any one cultural influence, though Rivera counts his Filipino upbringing as an inspiration. The shiniest highlights of Rivera’s seven courses include barbeque pork strip glazed in black banana, rolled up and pierced theatrically into a twig; calamari hiding cheekily under cucumber, chrysanthemum and charred coconut; Great Ocean duck, its leg, breast and heart topped with bright, seasonal berries; and a mango dessert with yoghurt, hops and crystallised saltbush, best described as a couture Weis bar. Along with the remaining courses, palate cleaners and petit fours, these dishes trot out in a slow and considered fashion that (miraculously) feels uncontrived. The staff is impeccably knowledgeable and genuinely passionate. 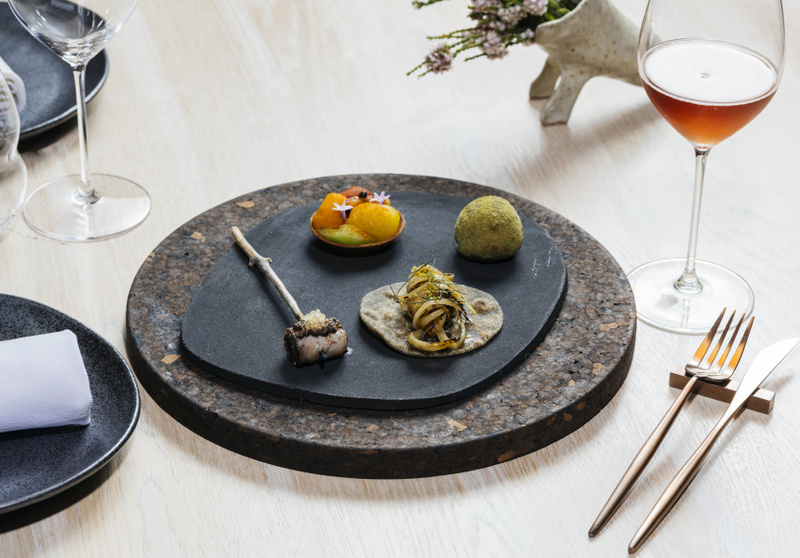 Wine, sake, beer and cocktail pairings elevate each course and at times rival Lûmé’s kitchen in their ingenuity. While developing his vision, Rivera felt he had big shoes to fill in succeeding Quade. But even at the humble age of 25, he is clearly up to the task. In 2012 Rivera studied pastry-making before starting at Neil Perry’s Rockpool Bar & Grill as a waiter. He then moved behind the pass, spending nine months in the kitchen as a junior pastry cook. Rivera relocated to Sydney to Rockpool’s flagship, where he spent 18 months honing his skills in the savoury arts. Feeling homesick in 2015, Rivera returned to Melbourne. After short stints interning at Brae and Attica, he found a home in the newly opened enigma Lûmé, spending two years under Quade’s mentorship. Rivera then moved on to Amaru as chef de partie, while landing the Gault & Millau Young Talent of the Year award in 2017, and San Pellegrino Young Chef of the Year, Pacific Region, in 2018.